Shell Deer Park is located about 20 miles east of downtown Houston, Texas. In 1941, Shell Chemicals Company formed the Deer Park Chemical Plant (DPCP). 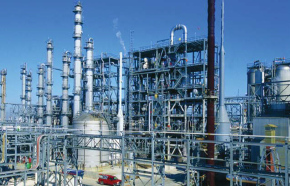 The assets of Deer Park Chemicals are managed and operated by Global Shell Chemicals. Deer Park Chemicals consists of Aromatics unit (Benzene and Xylene), Light Olefins unit (Ethylene, Propylene, Butylene), Heavy Olefins unit (Isoprene, Butadiene, Piperylene), and Phenol unit (Phenol and Acetone). A wide range of products like aspirin, plastics, synthetic rubbers, tapes, paints, solvents, pesticides, dyes, detergents, perfumes, adhesives, etc., are manufactured using the chemicals produced from Deer Park Chemicals. The hot side and cold side of the OP3 unit are operated without any major operational issues. However, the hot side of the OP3 unit was limited most of the time due to the furnace emissions (SOx, NOx, CO, etc.) were maintained high due to wrong calculations of emissions without flow and density compensations included. Because of this, feed cannot be pushed to the unit. The Pyrofrac, Compressor, Cold Box and the Separation sections were operating normal without any constraints. Honeywell TDC3000 is the control system used in the Deer Park Chemicals OP3 unit, and the existing hot side Advanced Process Control application of the OP3 unit was cutting feed to the unit due to high furnace emission constraints on the furnace. Yokogawa precisely followed Shell’s methodology of project implementation, actively participated in technical discussions, and took responsibilities in executing the project with required support from Shell. This Controls Improvement Program is implemented on all the 12 furnaces available in the OP3 hot side with the objective being to calculate the CEMS calculation more accurately, allowing more feed to be pushed to the unit. With the emission calculations accurately calculated, the existing Advanced Process Control application is always operated in optimization mode which enabled more feed to be pushed to the unit until the furnace hits constraints on the emissions. The Controls Improvement Program implemented on the Deer Park OP3 unit helped to push more feed to the unit by operating the furnaces close to constraints. This resulted in maximizing the desired products and reducing overall specific consumptions on the unit. A post-implementation study estimated that the overall Controls Improvement Program implemented at Deer Park OP3 hot side furnaces returns a benefit of pushing 5.3% extra feed to the unit with a VIR of 750. Shell Global Solutions and Deer Park Management were completely satisfied with the way the project was implemented and the results achieved.